I flew into Los Angeles earlier this week for work, and before I slogged down to Anaheim, I met a friend for lunch at Huckleberry Cafe in Santa Monica. Even though lunch was satisfying, we couldn't resist a return trip for dessert. 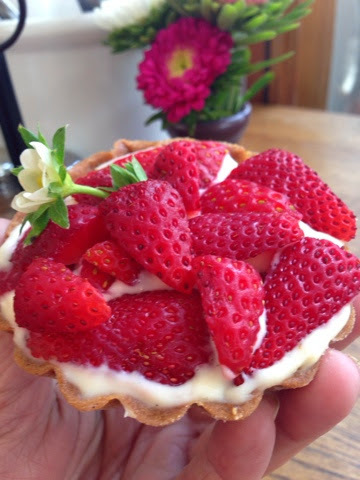 I mean look at this summer strawberry tart! I was also drooling over the merengue lemon blueberry parfait, the strawberry donut and the ricotta peach salad. I'll be back for that brunch too. Huckleberry Cafe is located at 1014 Wilshire Blvd in Santa Monica, CA. Follow them on Twitter at @HuckCafe and try their other restaurants.